Grilled Chicken, Rotisserie Chicken, Roasted Chicken, Poached Chicken… I almost always have some form of left over chicken in my refrigerator and one of my favorite quick meals to make with leftover chicken is my chicken fried rice. When I made this fried rice the other night I used leftover grilled chicken tenders and brown rice because that is what I had. If you don’t have any leftover chicken, using raw chicken is easy. Cut 2 chicken breasts into small, thin pieces and cook with the vegetables and soy sauces for about 8 minutes or until cooked through. Easy. 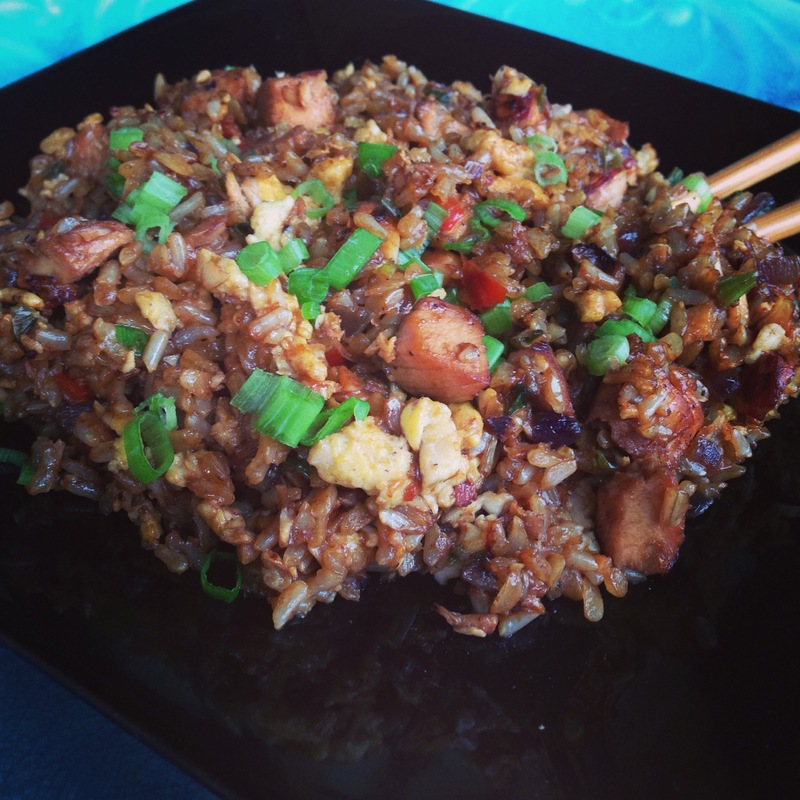 What really makes this chicken fried rice so amazingly delicious is the use light and dark soy sauce. We all know the yummy umami flavor of a traditional “light” soy sauce, not to be confused with “Low-Sodium” soy sauce. But not many know much about dark soy sauce. Dark soy sauce is richer, thicker, and less salty than regular soy sauce. Think of dark soy sauce like the molasses of soy sauces, although dark soy sauce isn’t as thick as molasses. Dark soy adds a beautiful deep mahogany color to dishes and is perfect to add in stir-fries, glazes and marinades. Just make sure that you are always buying a good quality soy sauce because there are many “fake” soy sauces out there on the market. Look for something that says Naturally Brewed or 100% Soy. If you are Gluten Free or watching your Gluten intake I really like using Tamari Soy Sauce. I hope y’all enjoy and give this recipe a try. Let me know what you think. Heat a Wok or large skillet over high heat, with 1 Tablespoon of Peanut oil. When the oil is hot crack the 4 eggs directly into the heated wok, let them cook for 1 minute then scramble them with a wooden spoon breaking the eggs in to small pieces. When the eggs have cook through, remove them from the pan and set to the side. Add 1 tablespoon of Peanut oil and 1 teaspoon of toasted sesame seed oil to the hot wok and quickly stir-fry the diced onion and minced chili for 2 minutes, over medium high heat. Then add in the garlic and ¾ of the chopped green onions and stir-fry for another 30 seconds. Add in the chicken, 3 tablespoons of Light Soy Sauce, and 1 tablespoon of the Dark Soy Sauce. Cook the chicken and the vegetables for 4 minutes over medium-high heat. Stir in the cooked rice and add 1 tablespoon of the Dark Soy Sauce, 2 Tablespoons of Light Soy Sauce and the 1 Teaspoon of the Toasted Sesame Seed Oil. Stir to combine. Leave the rice alone in the pan for 2-3 minutes, over medium-high heat or until you see the rice crisping up around the edges, then give it another stir and repeat. Add the remaining green onion and the scrambled eggs to the rice. Stir to combine then serve. It’s all Greek to me…. Opa!! !